Harbour Holidays is pleased to announce that its new brochure for 2019 Padstow cottage holidays is now available for potential customers. Cornish holiday letting agency Harbour Holidays has released its latest brochure showcasing the range of cottages and holiday homes it has available to rent in 2019. The new brochure features almost all of the 175 holiday properties the company represents in and around padstow, on the north coast of Cornwall. Formatted as a handy, landscape booklet, the brochure is printed in full colour providing potential holidaymakers with loads of information and attractive photos to help them make their holiday choices for next season. As well as property listings, the brochure is packed with information and inspiration on things to see and do while on holiday in Cornwall. These featured articles include guides on the best beaches to visit near Padstow, the town’s top restaurants to dine in and exciting outdoor activities to try while on holiday in the area. Padstow is an historic fishing town, located beside the Camel Estuary on Cornwall’s north coast. It’s a popular holiday destination year-round thanks to its beautiful harbourside setting, attractive narrow streets, stunning sea views and the number of quality restaurants in the town, including those owned by famous chefs Rick Stein and Paul Ainsworth. 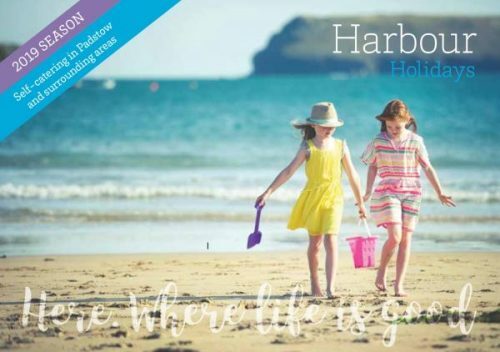 Harbour Holidays produces a brochure each year to inspire existing and prospective customers to research and book their ideal holiday accommodation in Padstow well in advance of their trips. The brochure has been sent out to previous customers who signed up to receive a copy through the company’s mailing list. It is also available to pick up in the Harbour Holidays office in Padstow. The 2019 brochure from harbour Holidays can be viewed online at this SlideShare page.